There was plenty of holiday hockey involving the New York Islander and New York Ranger prospects on Friday to go along with those Thanksgiving leftovers. It was an interesting mix of games with the defensive prospects once again leading the way. People thought I was crazy when I said Robbie Russo (NYI 2011 4th) had to put up numbers offensively for his 10th ranked Notre Dame Fighting Irish to have a good season in their debut in the Hockey East league. At the time I believed that Irish were lacking offense but I was not expecting the Irish to be as riddled with injuries as they have been making the need for Russo to contribute that much more critical. On Friday evening the Irish were hosting the Shillelagh Tournament and yes the opposition was winless Alabama-Huntsville but you still need to score to win. Russo with a 1-2-3 evening helped Notre Dame earn a 5-2 win over Alabama-Huntsville to advance to the finals of the Shillelagh Tournament. Russo earned the game's 2nd star with his efforts as his first point was defensive partner Andy Ryan putting in a rebound of a Russo shot to give Notre Dame a 1-0 lead at the 4:08 mark of the first period. In the 2nd, Russo got the only assist on Mario Lucia's goal when Lucia fired a shot that beat Alabama-Huntsville goalie Matt Larose fanned on giving Notre Dame a 4-2 lead at 13:18. 2:36 later with Notre Dame shorthanded, Russo scored his 3rd goal of the season at 15:54 when he banked a shot off Larose's skate for a 5-2 Notre Dame lead. For Russo the 3 point effort improves him to 3-7-10 on the season, Notre Dame will face fellow Hockey East member Northeastern in the finals of the Shillelagh Tournament on Saturday night. 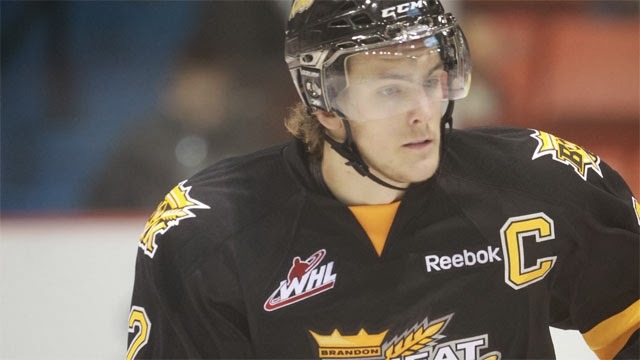 Ryan Pulock (NYI 2013 1st) had a goal and an assist as part of a 5 goal second period by his Brandon Wheat Kings as they doubled up on the Moose Jaw Warriors 8-4. Trailing 2-0, Brandon exploded for 4 goals in 3:36 to take over the game and never look back. Brandon was trailing 2-1 when Pulock scored an unassisted goal at 3:19 to tie the game up at 2-2. It was Pulock's 10th goal of the season and 2:28 later after Brandon had taken a 3-2 lead, Pulock got the primary assist on Eric Roy's power play goal at 5:47 to make it a 4-2 lead. Pulock improves to 10-15-25 on the season. Adam Pelech (NYI 2012 3rd) had an assist and a +1 while teammate Troy Donnay (NYR 2013 UFA) was scoreless with a fight as their Erie Otters defeated the Mississauga Steelheads 6-0. Pelech had a secondary assist on Erie's 4th goal, a power play goal in the 1st period for Pelech's 13th assist of the season and 19th point. Donnay got into his 3rd fight of the season when he instigated a fight with Adam Goldberg of the Steelheads. Not sure of the details of the fight but Donnay was a mismatch at 6'7 against a 5'11 player. Donnay got the instigator and misconduct for this one. Kyle Burroughs (NYI 2013 7th) had a secondary assist as his Regina Pats gave away a 5-0 lead and dropped a 7-6 overtime decision to the Prince Albert Raiders. There is no excuse for this one as Ranger fans know what blowing a 5-0 lead feels like. Burroughs is 2-17-19 on the season. Adam Tambellini (NYR 2013 3rd) had a secondary assist on North Dakota's 2nd goal of the game but that did not stop North Dakota from dropping an embarrassing 5-2 decision to the St. Lawrence Saints. North Dakota is winless in their last 4 games and fell to a disappointing 4-7-2 on the season. Tambellini registered his 2nd assist of the season to improve to 2-2-4. Griffin Reinhart (NYI 2012 1st) was scoreless as his Edmonton Oil Kings edged the Lethbridge Hurricanes 2-1. The Oil Kings could only manage 2 goals on 45 shots thanks to a Lethbridge goalie Corbin Boes who stood on his head playing an unbelieveable game. Brady Skeji (NYR 2012 1st) was scoreless on 1 shot and a +1 as his top ranked Minnesota Golden Gophers made their Big 10 debut with a 4-1 win over the 13th Wisconsin Badgers. Taylor Cammarata (NYI 2013 3rd) missed the game with a back injury (listed as day to day) and Jake Bischoff (NYI 2012 7th) was a health scratch. Cristoval Nieves (NYR 2012 2nd) was scoreless on 3 shots as his 3rd ranked Michigan Wolverines needed overtime to defeat Ohio State 4-3 in their Big 10 debut. Nieves was more active in this game which is a positive sign but we need to see him keep this up. Loic Leduc (NYI 2012 4th) was scoreless on 1 shot with a +1 and 3 hits as his Cape Breton Screaming Eagles came from behind to defeat the Halifax Mooseheads 4-3. Got to give Leduc his due as he is playing a more active game to try to earn his pro contract and this is what players in their 2nd year have to be doing. Jesse Graham (NYI 2012 6th) was scoreless in his 2nd game as a member of the Saginaw Spirit as they dropped a 2-1 overtime decision to the Sarnia Sting. Graham was the starting defenseman for the Spirit and looked pretty comfortable out there. Ryan Graves (NYR 2013 4th) was scoreless on 2 shots, a -1 with 1 hit as his Charlottetown Islanders lost to the Rouyn-Noranda, Huskies 5-2. The Islanders are winless in their last 4 games now. Steven Fogarty (NYR 2011 3rd) remains out with an undisclosed injury for Notre Dame and Stephon Williams (NYI 2013 4th) has lost his starting job at Minnesota State and was "DNP" Friday night.